If you get frustrated with people telling you, “slow and steady wins the race”, and you have a sense God’s church should be busting out all over the place, then you will find Viral Churches, by Ed Stetzer and Warren Bird, a welcome relief. As they say, “This book can be summarised in two words: multiply everything”. For the authors, this means finding and using church planting strategies that lend themselves to multiplying disciples, leaders and churches. Practically, this means moving beyond church planting by “addition” to church planting by “multiplication”. The rationale is that until every person has the opportunity to meet Jesus followers in their neighbourhood who can lead them to Jesus, the task of spreading the gospel is not yet done. To remove the barriers that often stop people like you and I from taking the step towards planting churches to reach these people, Stetzer and Bird provide some solid research and observations from their knowledge and experience. Chapters on emerging church planting networks, predictors of success, funding and church planting models are fair, thorough and insightful. Among many examples of valuable and, sometimes counter-intuitive conclusions, Stetzer’s research has concluded that while most “successful” church planters believe additional funding could have aided their growth even further, the data shows that funding has very little bearing on the effectiveness of church plants. At points like this, Stetzer wastes no time in reminding readers that believers around the world are seeing rapid growth without any funding and that the God who created the earth is more than capable of funding any church he seeks to grow. 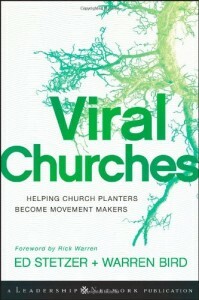 Despite thorough evaluation of church planting mechanics such as funding, Viral Churches refuses to be boxed in to focus on particular methods or models. Rather, case studies, loads of really helpful statistics (what you’d expect from Stetzer), biblical exposition and observations from both current and historical church planting movements encourage readers to consider planting churches that are designed to multiply rapidly from the get-go. Personally, the key strength of this book comes from the sense of momentum that the real-life stories and statistics convey. While the big picture is that God’s church is advancing, the need for the gospel to go forth is constantly reiterated as the primary motivator for church multiplication. It is this urgency for the eternal power of the gospel that is so refreshing about this work. While church models are evaluated, “guru” church planters are interviewed and statistics are compiled, Stetzer and Bird identify one of the most critical needs is for need for individuals and church plants to “make intentional evangelism a defining and ongoing aspect of their new church”. If you are after simple, week-to-week “how to” advice on church planting try Church 3.0 or Exponential. But if you are looking to expand your vision, catch up with where the non-Western church is heading and be part of taking the gospel to all nations then Viral Churches is an absolute must-read. ~ by Dan Harding, Church Planter and Executive Pastor of CityLife in Brisbane.